Since we have been cutting down on our sugar intake I’ve been on the lookout for more savory things. 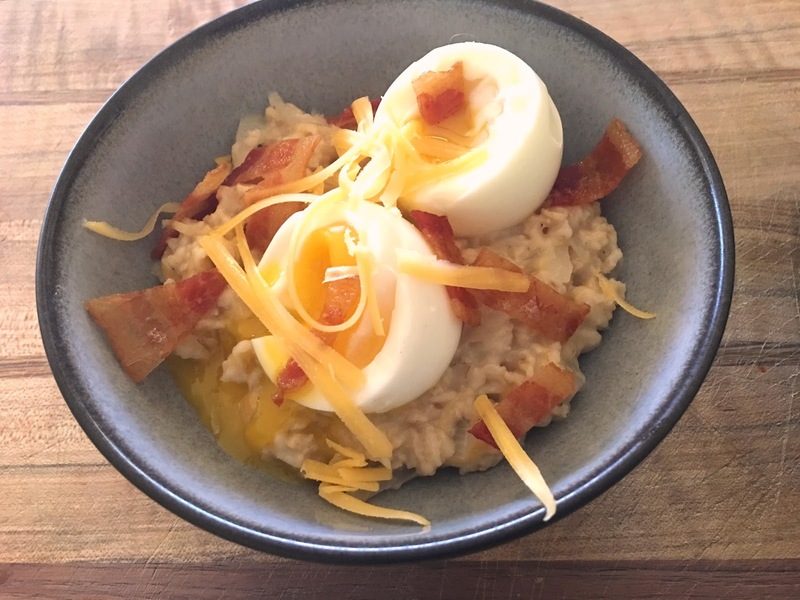 When I first saw this recipe for Bacon “N” Egg oatmeal in the “I Quit Sugar Cookbook” I immediately bookmarked the page and set it aside. Last Sunday after a strenuous hike, we were starving and pondering breakfast. I remembered this recipe. We stopped for the bacon on the way home and ended up purchasing a center-cut brand with very little fat. In the original recipe Sarah Wilson, the author recommends other grains as well; like buckwheat or quinoa. This dish is not too complicated, full of flavor and will definitely stick to your ribs. First a onion and fresh garlic were sautéed; then water and oats were added and cooked on the stove-top until the liquid evaporated. Cheddar cheese was added; then pieces of the bacon. Our brunch was served with a soft boiled egg on top. It was just what the doctor ordered. What was surprising was that all these flavors worked so wonderfully together with oatmeal of all things. Will be making this again and again. Heat the oil in a medium-sized pot or saucepan over medium heat; sauté the onion and garlic about 10 minutes or so until translucent. Add oatmeal and water, and stir occasionally until the liquid has evaporated about 10 minutes. Take the pot off the heat and set aside. Add cheese. Then dished out into serving bowls, add bacon, herbs and then top with egg. Enjoy! This recipe has been slightly adapted from "The I Quit Sugar Cookbook" by Sarah Wilson. Thanks Summer, we enjoyed this! I love making savoury oatmeal. I actually have a recipe for savoury oats in my book. Can't wait till your book comes out Dannii. Savory oatmeal is so good, isn't it? I usually have it with cinnamon for breakfast (I actually don't like sugar with oatmeal), but this looks SO much better. Gotta try it! Thanks for this. Hi John, wow, cinnamon is supposed to be so good for you, will have to try. YES! This is definitely my favorite type of meal! I'm a total egg lover and would die to try your oatmeal... Great recipe! Thanks for sharing! Hi Marcela, I am a big egg lover too! Looked at your post Dena, lovely story and muffins. Take care! This recipe is so innovative. YUMMY! I've been trying to cut back on sugar, too, but ate a lot of chocolate frosting tonight :/ I need more breakfasts like this one!!! Hi Liz, it is certainly harder than I thought to cut back, but it is getting easier. Savory Oatmeal? Who would have thought? Why you of course! Hi Louise, I was surprised myself, it is delicious. Hi Tandy, hope you get a chance to try this, it will change how you think about oatmeal. Thanks Moumita, hope you have a chance to try this. Hi Anu, I was kind of on the fence about this one, so glad I made it, it changed the way I look at oatmeal. Hope you get a chance to Karen, savory oatmeal is really delicious. I have yet to try a savory oatmeal. Not sure why I haven't, because this sounds so good! Hi Abbe, this was my first foray, so glad I did so delicious! Hi Monica, that's interesting that you eat oatmeal as a starch for dinner, great idea. Have a wonderful week-end! 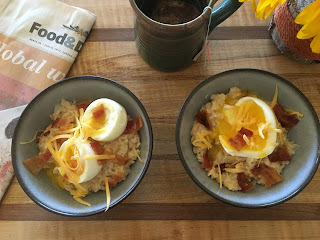 This is so creative Cheri - I never would have thought of savory oatmeal - but you're so right - it is hard to find non-sugary breakfasts. That book this is from sounds interesting. Last year I did Whole30 for a month and it was really enlightening on how much sugar I was consuming. Sadly I've kind of gone back to my old ways, but this is definitely making me reconsider. Thank you for sharing this! Hi Phi, I know what you mean, sugar is probably the hardest thing I tried to cut out of my diet, first of all it is in most everything packaged. Take care. I actually prefer the savoury oatmeal bowls. Bacon and egg make this a perfect breakfast. Thanks Angie, I've always had the sweetened ones, never even thought of savory as an option. i haven't ventured into the world of savory oatmeal yet--i like my sweet fruit too much! this is awfully appealing though!! Hi Grace, hope you have a chance to try a savory one, you will be surprised. You've surprised me with this. But then, recently I forgot to add salt to my porridge during cooking and was startled to realise just how raw it tasted. Would that then leave it perfect for savoury? Sounds like it. Sounds like it to me Johnny.....I was surprised myself, savory oatmeal is good. How did I miss this post?!! Eggs, oatmeal and veggie bacon are my go-to for any meal! Looks like your breakfast bowl is the perfect ending to an energetic exercise like hiking! Thanks Kim, we love our morning walks. Wow - things sounds fantastic! I love oatmeal and am battling the sugar content myself so this looks like a win/win. (Thanks for your visit. I have been struggling with computer issues and am SO behind on my blog reading.) Enjoy your week! Hi Mindy, thanks for stopping by. Heard you are having some great wheather, take care of yourself. 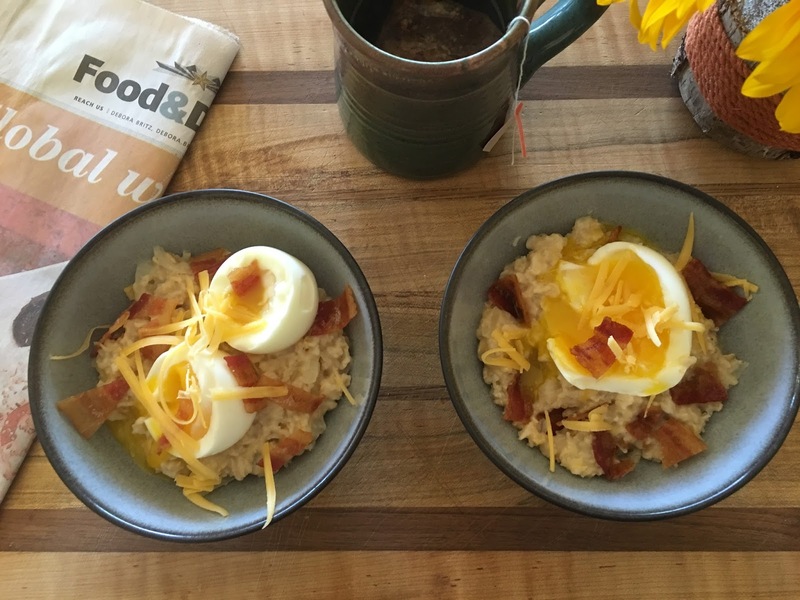 Cheri, what a wonderful way to prepare savory oatmeal. It looks like a dish I would really enjoy preparing and eating too! Thanks Andrea, savory oatmeal really is a treat. Thanks Marcelle, this savory oatmeal was a big hit, I was surprised how much so. I often really like savoryi versions of sweet things. This is worth giving a try! Hi David, I do too, hope you have a chance to give this a try.